Standard quality control of each lot Western blot analysis (unlabeled antibody, #AGC-036), and immunohistochemistry (labeled antibody). Immuno-colocalization of Parathyroid Hormone 2 Receptor and VGLUT2 in mouse hippocampus.Immunohistochemical staining of mouse hippocampal CA3 region frozen sections using Anti-Parathyroid Hormone 2 Receptor (extracellular)-ATTO-488 Antibody (#APR-052-AG), (1:60) and Anti-VGLUT2-ATTO-594 Antibody (#AGC-036-AR), (1:60). 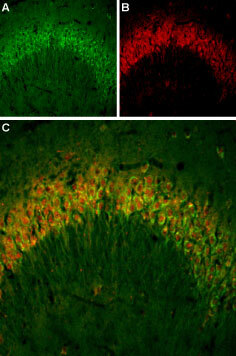 A. PTH2 receptor staining (green). 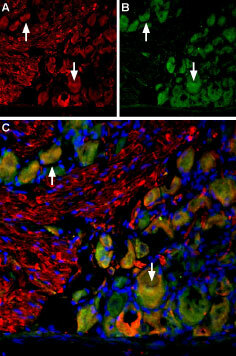 B. VGLUT2 staining (red) in same section. C. Merge of A and B suggests extensive localization of PTH2R on glutamatergic neurons. Anti-VGLUT2-ATTO-594 Antibody (#AGC-036-AR) is directly labeled with an ATTO-594 fluorescent dye. ATTO dyes are characterized by strong absorption (high extinction coefficient), high fluorescence quantum yield, and high photo-stability. The ATTO-594 fluorescent label belongs to the class of Rhodamine dyes and can be used with fluorescent equipment typically optimized to detect Texas Red and Alexa-594. Anti-VGLUT2-ATTO-594 Antibody has been tested in immunohistochemical applications and is especially suited for experiments requiring simultaneous labeling of different markers. Anti-VGLUT2 Antibody (#AGC-036), (for western blot analysis).